Hubby and I are big movie watchers...the stay at home and rent 'em kinda movie watchers though. A regular weekend usually includes two movies (and they're not always great so sometimes I bail and head to my stamp room...LOL!). 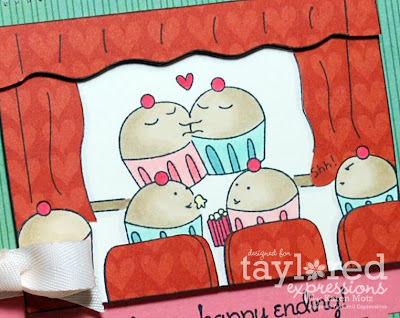 One thing hubby loves when watching a movie is a little popcorn to munch on, so I decided to make him a Movie Night Box. 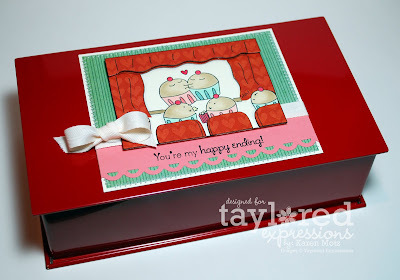 I had this red metal container in my stash (it originally held peppermint bark, which mysteriously disappeared!) and I thought it would work perfectly with Cuppie Love Scenes and my Valentine Key Ingredients. I started by stamping the movie image with Memento Tuxedo Black onto Choice Buttercream, then onto the heart patterned paper from my Valentine Key Ingredients. I coloured part of the image with copics and paper pieced the chairs and curtains. Then I ran my black ink pad around all the edges to give the image a little definition. I think my favourite part of this image is the little cuppie on the right...he looks so annoyed shushing the lovey couple. That would be hubby...he has a no-talking-except-during-commercials rule when he's really into a show (which means we watch movies in silence). I layered up a few papers and stitched them together then finished my panel with a sweet bow. I know I know...this box is supposed to be masculine, but really, who can resist a cute bow! I stuffed the inside of the box with some individual packs of microwave popcorn, but of course I had to decorate them just a smidge. This was super quick and easy too...I simply wrapped each pack with one of the patterned papers, added a center strip and topped it with a covered chipboard heart (also from my Valentine Key Ingredients). So look around your house for cute containers you can re-use in your crafting projects. I'm tickled that this red box worked out so perfectly for my vision! What a fantastic idea, Karen! I LOVE it! This would be an awesome gift for my sister and her hubby as they're MAJOR SAHM movie watchers as well. Thanks for the great idea and awesome job!! Oh and I'd have to add a little feminine touch here and there too!! You'll be enjoying it with him, right?? LOL! This is absolutely ADORABLE, Karen! I LOVE it! Karen, this is awesome! Love the decorated popcorn too! Oh I just love this!!! What a fantastic idea and sooo super cute! I think I'd have to gift it to myself though...I love watching movies more than the hubby does, lol! Great idea!! I have this set on my list for my next TE order!! What a really cute idea!! This is SO fab Karen!! LOVE LOVE LOVE this box and how you decorated the popcorn!!! Love it!! Great idea, and your paper piecing ROCKS! !